Simple Rustic Loaf is a beautiful loaf of bread that is easy to make and will leave you amazed that it came from your kitchen and not the bakery. Have you started your new year with a set of goals that you’d like to accomplish? I have, and even though they are probably modest compared to a lot of goals, I’m excited to get a start on them! 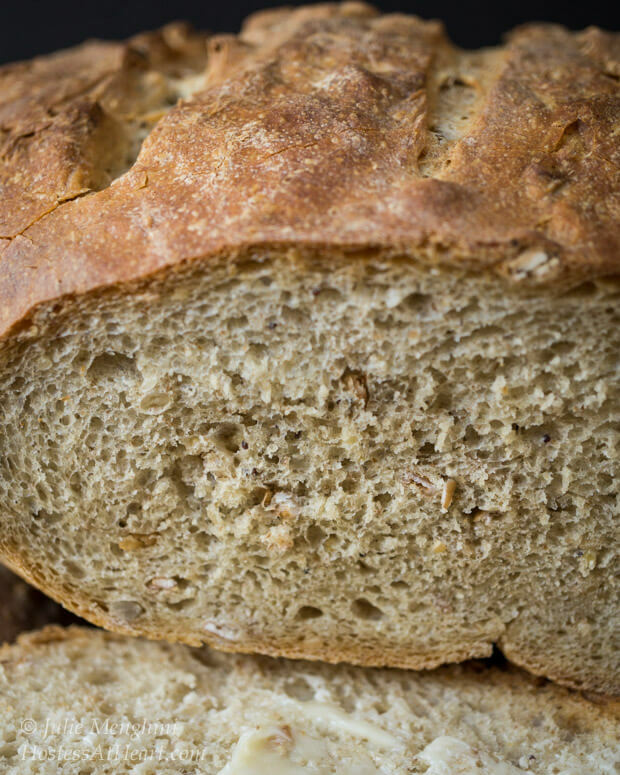 This Simple Rustic Loaf is a part of last year’s goals and a big part of this years goals. Last year one of my goals was to learn more about baking bread. To push myself in that direction, I joined a group of people that also enjoy baking bread and participate in monthly challenges. This group is called Twelveloaves, and there are people from all over with all degrees of skill. I’ve learned some great things from this group, and it’s my goal to continue pushing myself and my skill level. This month’s challenge was to use a flour that we’d never worked with. I chose pumpernickel. 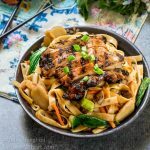 To tell you the truth, this recipe actually used very little pumpernickel flour, and I learned that there are a lot of pumpernickel recipes that use a combination of flours such as wheat and rye flour. I just loved how this bread came out. It has a wonderful artisan crust and the crumb is so soft and moist. 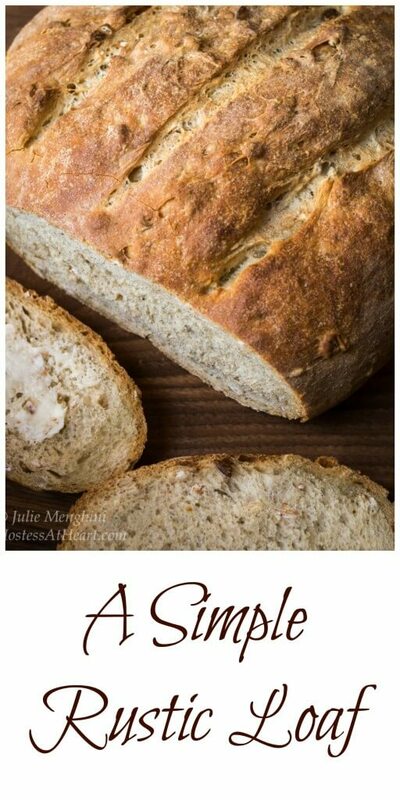 This bread is easy to make, and I think you will surprised that such a pretty loaf of bread can come from your oven. Bread can be pretty right? 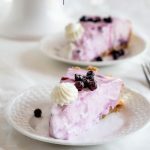 You will want to start this recipe either early in the day or even the day before which is what I did, because it has you make a sponge that needs to sit out on the counter for at least 4 hours. I left mine out over night and baked my bread the next day. Don’t let the sponge scare you. 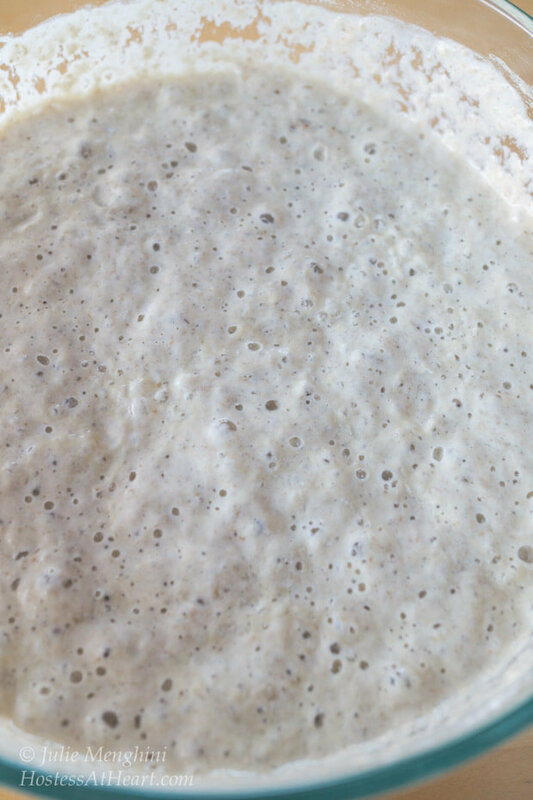 It’s just a flour yeast mixture that is allowed to sit out and will help the flavor of your bread develop. This picture is of my sponge after it sat overnight. All bubbly and ready to do it’s job. You will also note that I suggest you use filtered or spring water. That’s because chlorine can have an adverse effect on yeast. So, if your water is chlorinated, use bottled or filtered water. 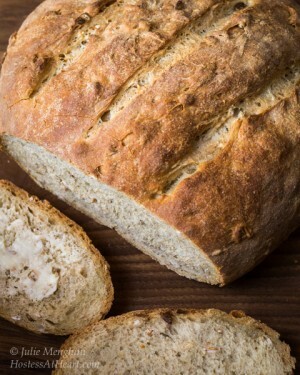 A Simple Rustic Loaf is a beautiful loaf of bread that is easy to make and will leave you amazed that it came from your kitchen and not the bakery. Mix the sponge ingredients together. Cover and let it sit at room temperature 3 to 4 hours or overnight. Stir down the sponge. In a large bowl, combine dough ingredients and the sponge. Knead until smooth and elastic. Knead in the Harvest Grains blend or your choice of seeds. Form a ball and put it into a large well oiled bowl. Turn once to coat both sides. Cover and allow to rise for 1 1/2 to 2 hours. Lightly grease a baking sheet, or cover it with parchment paper. Turn out the dough out onto the baking sheet, and form it into a ball. Cover and allow it to rise for 1 more hour. Preheat the oven to 450 degrees F.
Gently but firmly slash the dough across the top and then spritz it with water. Bake the bread for 30 to 35 minutes, until it's a deep golden brown. Remove from the pan and allow the loaf to cool completely on a cooling rack prior to slicing. Included in the prep time is inactive rising time. This month we are baking New-to-You Flour Breads that are perfect to celebrate the holiday season. 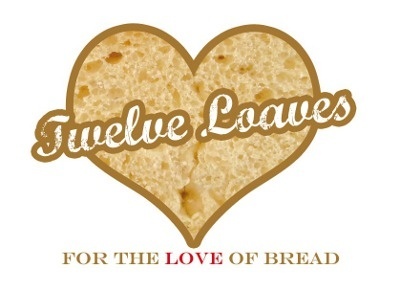 For more bread recipes, visit the #TwelveLoaves Pinterest board, or check out last month’s inspiring selection of #TwelveLoaves Holiday Breads! 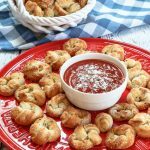 This recipe is shared with link parties Throwback Thursday, Fiesta Friday and Saucy Saturdays! Come party with us and pick up some amazing recipes! Thanks Shari, it really is soft and made great toast. I think next time I would mix the spelt with bread flour at maybe a 30/70 ratio to see if I can get it to hold the raise a bit more. Either that or raise the spelt only once for 30 minutes, because I did like the flavor. I know about the fails, seems like they group themselves together for some reason. Very frustrating! I did buy my pumpernickel and rye flour directly from King Arthur They also have a seed/grain mix that I love and I put it in a wheat bread recipe that I make regularly. I bought my spelt in my grocery store in the health market area. I believe it’s Bob’s Red Mill flour. Baking bread from scratch is one of my goals for this year. I have NEVER done it even though I’ve had packets of yeast sitting in my cupboard for at least six months. Does yeast go bad? I better hop to it! Happy 2016 Julie and thanks for linking up at #SaucySaturdays!! Good for you Christine, let me know if you have any questions. Your yeast has a expiration date on it. I’d replace it if that date is long gone but chances are it’s still fine. Julie, all that hard work has really paid off! Another absolutely gorge loaf!! Thanks for linking up to Throwback Thursdays! Delicious looking rustic bread there! I bet it doesn’t last very long if not already eaten up! Nice photos as well! Thank you Gerard! I really enjoyed that bread and will make it again. Thank you for the nice comments on the photos. That is a work in progress for me! 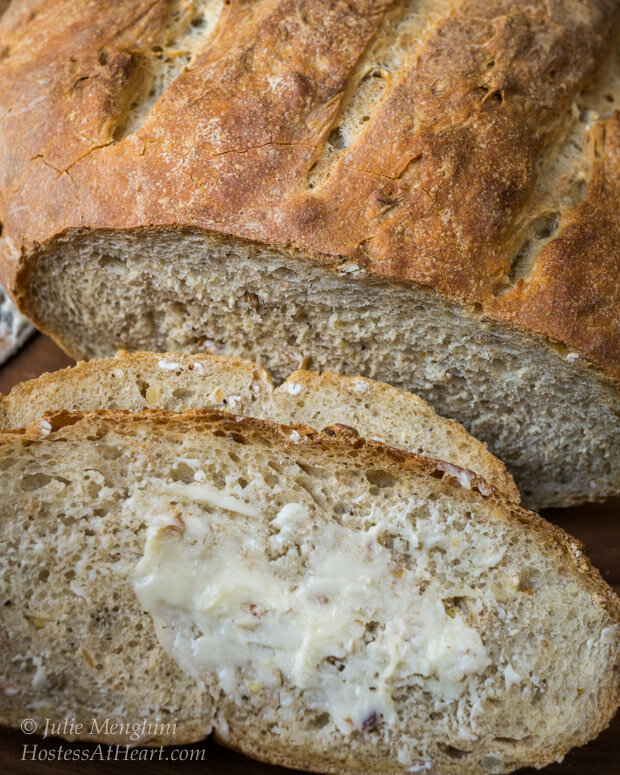 I always love seeing your bread baking, it always makes me want to try some again myself – will get on to it some day! Thank you Caroline! I love to bake, and there is just something about bread that I find therapeutic. There are so many things I want to make too, but just so much time and belly room! Thank you Jhuls! I sure had my share of this bread! Lots of bread that call themselves pumpernickel actually use rye. Over the past year, I have also been trying out various breads, especially experimenting with different flours. Haven’t come across pumpernickel flour before. The bread looks great. Happy Fiesta Friday, Julie! Thank you Ahila! It is fun experimenting. I found that even breads that call themselves pumpernickel are actually made with rye which can be used in this bread easily enough. That’s a fantastic looking loaf! Thank you Mr. Fitz and thank you for hosting FF this week! You got my interest with the butter on those bread slices! That’s my problem – I love bread but I often have to add some butter (or in my case Smart Balance). Ha! I love it too, and shame on me, it’s strait up butter! 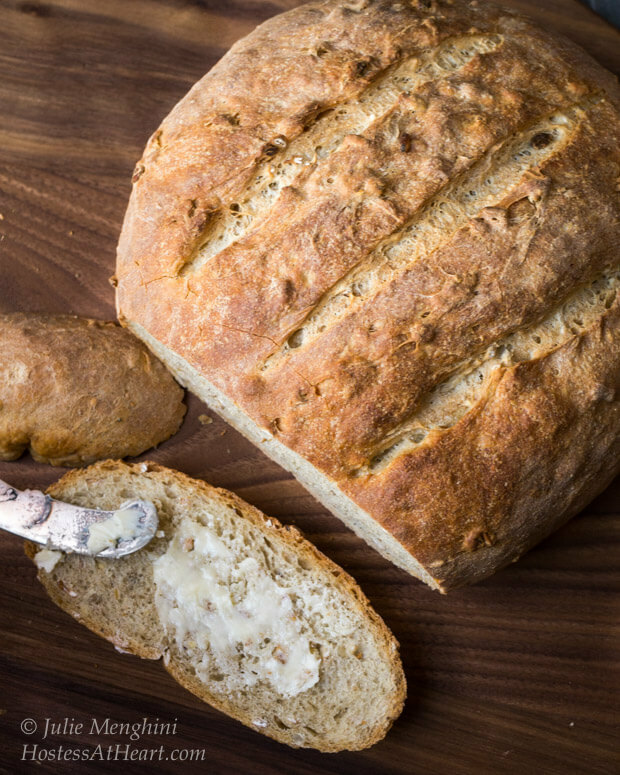 Love homemade bread and so this is right up my street! Thank you! The smell in the kitchen is just unbelievable when your baking bread. Now that is a good-looking loaf of bread. I am keeping my fingers crossed that I will be able to find pumpernickel flour somewhere here as I would love to try baking this bread. Also, thanks for the tip about chlorinated water. You can use a light rye flour Felice and I am sure you will be just as happy with it. This bread looks absolutely heavenly. Thanks for the tip on the water. Pinned. I’m your neighbor at throwback Thursday. Have a great night. Howdy neighbor! Thank you, this bread was fun to make, and I just learned that tip not long ago myself. I appreciate you stopping by. I can smell that bread Julie dear! Yumm it looks just perfect! Thank you sweet Lynz! Heavenly smell baking bread! Another one in the oven today! This bread IS beautiful! So perfectly rustic and so scrumptious looking! I love that it has a combination of flours to bring out all kinds of delicious flavors. I’m a very novice bread baker, but I can’t wait to give it a try! Thank you Kathryn! 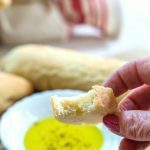 This bread is just delicious and very easy to make. I’m not an expert by any means but am sure having fun learning. Thank you for stopping by! I’m so impressed with this gorgeous and simple loaf (yes, bread can be so pretty!). I have to get experimenting with pumpernickel…I just love the flavor and that is going to be one of my bread goals his year! Thank you Lora! Your site is so inspirational and I’ve learned a lot from you! Thank you Linda! John had to go out of town and I think I just about ate the whole thing myself! I made some loaves close to this bread last Sunday. Mine did not look anywhere near as good as yours. :)) Happy New Year Julie!!! Thank you Quinn! I still have your raspberry swirl pound cake pictures that I need to do a post on and believe me, mine didn’t come out as beautifully as yours, but it was delicious! Happy New Year to you too! It looks wonderful, great work!! Have you tried the spelt yet? This weekend Elaine! It sounds like it is a looser and wetter dough? Would you free form bake it Elaine or use a banneton or bread pan? Thank you Lili! I hope you’ve recovered from your schooling. So happy to see you today! Thank you Karen! I use that grains blend a lot in my weekly wheat bread. Such a beautiful loaf of bread, Julie, and the flavor/texture sounds wonderful! Thank you so much Anna! I was happy with the way this one came out. Thank you Anna! I’m doing a number on it myself! My carb loving fanny needs to stay away from it! This looks gorgeous! I had never heard of special pumpernickel flour, so I am intrigued! I have to make my own, and it’s mostly rye berries and coarsely ground rye. What a wonderful loaf you have made – the perfect start to the year! Thank you Ginger! I don’t think there was anything special about this pumpernickel flour. It was actually very light and the flavor isn’t a strong rye or pumpernickel, but it is delicious. I am not ready to make my own flour yet, but really admire you ladies that do! Exact same reasons why I joined this group 🙂 And I have been eating more pumpernickel lately but have not made any so will try your great looking pumpernickel loaf. Thank you Evelyne! It’s an easy and delicious one. I’d definitely make it again. Julie, I have visions of you and John only eating bread and a bunch of sweets???? LOL Naturally I know better! Actually Cheryl we do love our bread with…..wine! LOL may have some cheese as well??? I want to bake more breads too this year! I agree Sonal! I want to tackle sourdough and get more artisan results. Enjoy your day! Ahhh the aroma of freshly baked bread – nothing like it in my opinion! The sponge part is new to me, but wow does it look delicious, crusty on the outside, soft and melt in your mouth interior with melted slathered butter! I get KAF’s posts on my FB page, and one in particular caught my eye which Ive bookmarked. It should be relatively simple, it makes a batch of artisan bread, but you leave it in the refrigerator and then bring out bits of the dough as and when you want to bake, so it is fresh. I think I’ll attempt that as it looks fairly simple. I have made your English Muffin bread before and it too was so delicious. Thank you Loretta! I really like the KAF recipes and always look at the reviews for ideas. The refrigerator method sounds kind of like the amish bread technique that was popular several years ago and seems to be making a comeback. Leaving it in the fridge like that is great for developing flavor because it has a longer fermenting time. Please let me know what you think. I made two of the English Muffin bread loaves when Michael was home. It went over well. I want to tackle sourdough this year and have a couple videos just waiting for me to watch. Let me know how your bread comes out! Thank you Chitra! So happy that you popped in! Thank you Dawn! I almost skipped this one because I’ve been so busy but very glad that I didn’t! I hope your holidays were great and that you have a wonderful New Year!